Traditionally, monogrammed silver carried a touch of class. Its understated elegance speaks quietly of your confidence and polish. 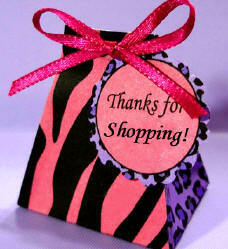 A very personal gift or a fabulous way to treat yourself. Monogram with your individual initials to bring a classic look that will never grow outdated. 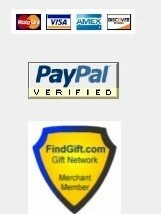 Gift from the Heart . 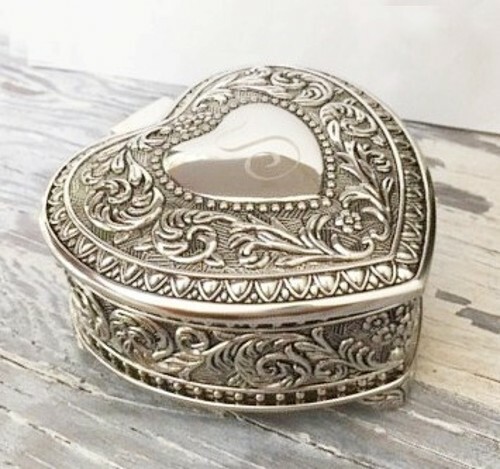 . .
Our charming Genoa Heart Shaped Box features a hinged lid with top. 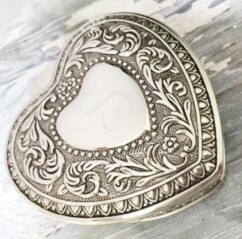 There is a center silver heart ready to engrave. The finish is non-tarnished antiqued silver plate. The interior is fully lined in black flocked cloth. 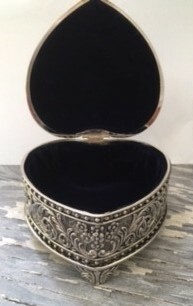 The intricate designs on the exterior of this box feature 3 integrated feet with a lovely vintage look.